The 100 x 100mm 81A Light Balancing Filter from Lee Filters is compatible with a LEE Filters 100mm System filter holder. It is uniform in color and with a mired shift value of +18, can be applied to purposely create a warm cast over an entire image. 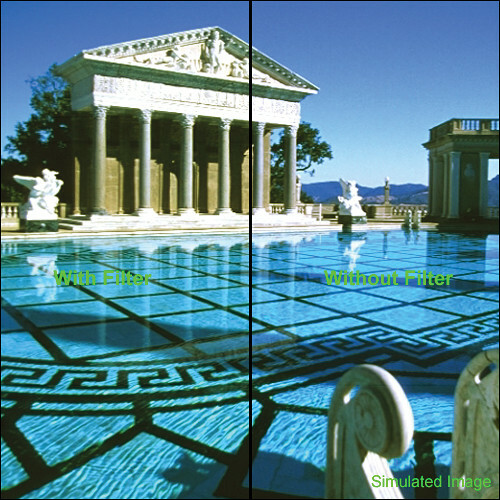 This effect can be obtained under daylight when this filter is used on a film camera system with daylight film installed, or on a digital camera system with its daylight white balance setting selected. The Lee Filters 100 x 100mm 81A Light Balancing Filter is also useful for balancing light sources with a color temperature of 3400K for type B tungsten film, which is designed to accurately reproduce colors under 3200K light sources. This filter is made of optical-quality resin and measures 2.0mm thick. A padded pouch is also included with the filter. When used, the Lee Filters 100 x 100mm 81A Light Balancing Filter's 0.1 density darkens the entire image by 0.3 stops. This reduction in exposure can be compensated for by adjusting the aperture setting of the lens it is placed on, or the shutter speed of the camera being used. The greater the difference between the color temperatures they are designed to correct for over 3200K, light balancing filters for type B tungsten film are considered to be progressively stronger in their effect when used to add warmth to a daylight image. Box Dimensions (LxWxH) 6.0 x 5.5 x 0.8"